Made with high quality nylon, its ergonomic design allows you to use it for any type of fitness exercise: running, jumping, pull-ups, muscle-ups, ring dips, dips, Olympic lifts, etc. The vest has padding on the shoulder area for greater comfort. It also has an adjustable fastening belt, with a quick release buckle so you can put it on and take it off very easily without having to readjust it with each use. You can perfectly adjust it to your chest and back and it won’t move while you exercise. The 5-kg weight packs (comprising 10, 500 gr pieces) are crafted with carbon steel and zinc-coated at high temperatures to prevent them from rusting with sweat. You’ll be able to add up to 30 kg in packs of 5 kg. Our sandbag is made from scratch and humidity resistant fabric and has double seams and nylon handles. Load it with up to 15 and 30 kg. Made from high density steel and zinc-coated at high temperatures to prevent rusting. 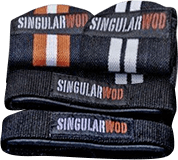 Add up to 30 kg to our Singular WOD vest. Strengthen your core and improve your stamina with this great Fitness unknown. Use it as a complement in your functional trainings. From 5 to 20 kg. Wall- and ceiling-mounted pull-up bar. Use it in your garage or in your box, it takes up little space.